Admiral Sports is pleased to announce a strategic partnership with Duluth FC, a National Premier Soccer League (NPSL) side from Duluth, Minnesota. Duluth FC attracts fans from all throughout the Northland of Northeast Minnesota and Northwest Wisconsin in addition to a growing following in the Minneapolis/St. Paul Metropolitan area. Duluth FC is a young club given that is only in their third season. Still they have arrived on the national scene as a member of the NPSL due to their success on and off the pitch last year as part of a regional league. They were second in the standings at the end of the 2016 season, only one point shy of the eventual champions. It’s no wonder that they feel strongly about the level of success they expect from their inaugural season in the NPSL. They also believe that their club represents and serves their local community well and they expect to grow as one of the threads in the mosaic of the City of Duluth. Clubs choose Admiral because of the value, factory direct pricing, and a custom kit that promotes the club brand. 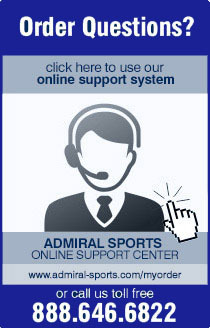 Admiral also offer our clubs an online store and service that's personal from the owners of the business. Admiral has been innovating in the soccer market since 1914 and will continue to do so in 2017 and beyond.